Dubai Diaries - My Dubai Shopping Haul - Part 1 | TSD Travels | The Shopaholic Diaries - Indian Fashion, Shopping and Lifestyle Blog ! A few weeks back I had visited Dubai for a vacation and I had shared many updates on my Instagram page. 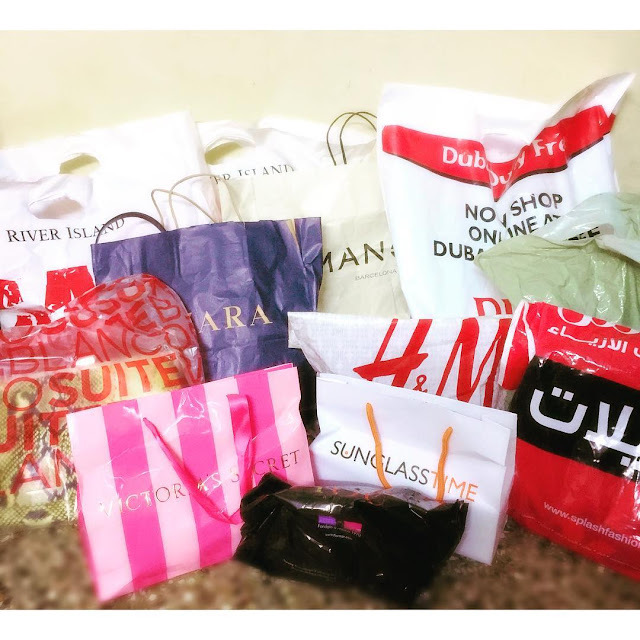 Finally, I am back into my regular routine and decided to share all about my trip to Dubai with my Shopping Spree. I did most of my shopping from the Dubai Mall and Dubai Duty Free as I really didn't get much time to explore the local markets. My first stop in Dubai Mall was the RIVER ISLAND store. I have always checked the collections available at ASOS and most recently Jabong and I really love the edgy stuff they have to offer. So, I ended up purchasing a hot pink Skater Dress which was priced at around 150 Dirham after discount. They have really an amazing collection of dresses and skirts which I fell in love with, but with my wardrobe already overflowing with so many apparels, I thought of just purchasing this Skater dress as it fit me beautifully. I also purchased a pair of beige Wedges and a color-block Handbag from RIVER ISLAND which were both priced around 150 Dirham each. Girls, RIVER ISLAND is one brand which can give really tough competition to ZARA and Forever21 in terms of designs and pricing. I wish they open a store in India soon! Next, I visited SPLASH stores to purchase a few T-shirts for my brothers and cousins as they offer a wide range of Tees and Shirts in exciting prints. I purchased 4 of these T-shirts for 25 Dirham each (couldn't photograph the rest 2 as my younger brother took them as soon as I was back from Dubai). I am so glad I visited Victoria's Secret as the store at Delhi Duty Free didn't have the Lingerie collection and a very limited collection of Beauty products. I explored Victoria's Secret on the last day of my Dubai vacation and I am so glad I did as it was like visiting a mall in itself. As a ritual of anyone visiting a foreign country and bringing home Chocolates, I also purchased Tiffany candies, Hershey's chocolates and mini-Marshmallow candies for my friends and cousins as I knew they will ask for these - the first thing when I come back home. I will be posting rest of the things I purchased in the second part which will also feature my first PRADA purchase. Exciting, right? Stay tuned for the next post then! Let me know if you wish to know anything more about my Dubai trip and shopping in the Comments below. I invite you to enter a very quirky giveaway on my blog. Thank you for the awesome information you are rendered to us.And really it is good to know this.Please keep sharing such blogs with us.